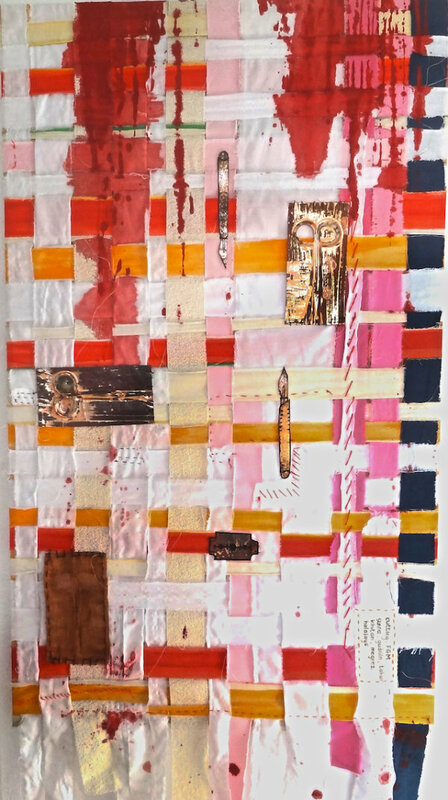 Woven textiles, bandages, copper, enamel and stitch, 55cm x 110cm. Mary : "'The Cut' is a piece made to highlight the issue of 'cutting' or FGM (female genital mutilation). This practice, while illegal in many countries, is still carried out clandestinely in some, and openly in others. It is estimated that FGM affects 137,000 women and girls in the UK alone. The World Health Organization says that more than 200 million girls and women alive today have undergone female genital mutilation, and every year millions more girls suffer this appalling abuse. This art work echoes a campaign for women to own their own bodies and to be free of the status of a ‘commodity’ to be bought and sold. FGM is very difficult to eradicate as it is woven in to the beliefs, customs and social fabric of many cultures - bandages and strips of fabric are woven into the piece to show this. Cutting instruments are represented in copper foil and mesh. A section of text lists the names used for 'cutting' in a range of countries throughout the world."